Dubai, UAE, March 22, 2018: The world’s biggest beauty tech brand, FOREO, has just launched the toothbrush of the future - the ISSA 2, a sonic electric toothbrush that combines state-of-the-art technology with unparalleled durability: a one-hour charge lasts up to an incredible 365 uses. Setting a new global standard for advanced oral care, the revolutionary, new generation toothbrush has become a firm favorite of the who’s who of lifestyle bloggers and it doesn’t stop there - the award-winning ISSA’s influence even extends to outer space, and in 2017 it made a cameo appearance in Episode 5 of Star Trek: Discovery. Sweden-based FOREO aims to empower you to brighten your life, by offering a new standard of beauty and wellbeing solutions to a wider audience than ever before. Our approach is a bold one: we don’t just improve existing designs; we tear them down completely and restart from the ground up - ensuring the best solutions are not reserved for the wealthy few. That’s also why we’re called FOREO, short for “For Every One.” We create groundbreaking, accessible solutions that bring happiness and benefit to everyday lives, at a fraction of the cost of professional treatments. We’re here to promote self-confidence: when you feel good, you look good - and our mission is complete. An ultra-hygienic alternative to both manual brushing and conventional nylon-bristled electric toothbrushes, ISSA 2 differs from traditional models by way of its material; medical-grade silicone. In addition to the standard version with the hybrid brush head made of nylon and silicone combination , ISSA 2 is also available in an exclusive “Sensitive” Set which includes one hybrid brush head and one brush head made completely out of silicone for those with specially sensitive gums. Soft silicone bristles are gentle on gums and won’t scratch tooth enamel. 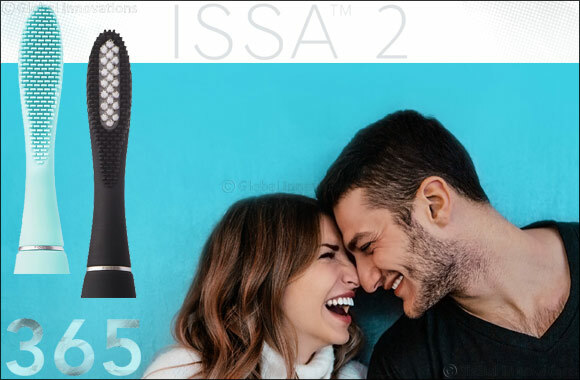 Designed to be used like a manual toothbrush, the ISSA 2 does not oscillate like conventional electric models. Instead it incorporates T-Sonic technology to pulsate at a frequency of 11,000 pulsations per minute for micro-sweeps that effectively, yet gently, clean teeth and massage gums. A superior brushing experience for a whiter, brighter smile, ISSA 2 removes plaque for total oral care and is particularly suited to those with sensitive gums, or for whom erosion of tooth enamel is a concern. 16 variable speeds, as well as a built-in timer to prevent over-brushing. Rechargeable via USB, lasts up to 365 uses. Ideal for traveling: travel lock feature and no bulky charging dock to transport. Two-year limited warranty and a 10-year quality guarantee. Stylish and chic, ISSA 2 by FOREO also looks the part, and is available in four striking colors to brighten up any bathroom surface, with the Sensitive set coming in two vibrant colors.